Both prior to and after 1965 demand for airports skyrocketed globally as the jet airplane era began. Although fostering pipe pilots an urgent national issue, they were obliged to be trained in the U.S.A. due to the absence of a domestic training airport. Reflecting such circumstances and airline demands, Administrative Inspection Advice was given in 1965 and a Council for Civil Aviation Verdict (report) was held in October 1966. Based on these, the Ministry of Transportation decided to promote training airports all over Japan. 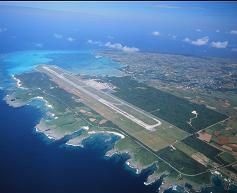 Shimoji-jima Airport was initially constructed as a private airport in July 1973, but became a type-3 public airport in May 1979. The airport resumed service in July 1979 and airlines launched comprehensive pilot training programs from November 1980. Although Southwest Airlines initiated regularly scheduled flights by YS11 aircraft from November of the same year, it was obliged to discontinue regular operations in July 1994 due to low demand. Operation of regular flights of South West-Airline for Naha commenced. Operation of regular flights was suspended. Services of altered facilities (apron expansion) started.